That's right. I am blatantly requesting you purchase my book if you are reading this post. Wait. Aren't we supposed to slowly and methodically convince people to purchase instead of blatantly asking? Yep, but I'm like the guy in the bar who has grown tired of all of the game playing and has instead chosen to go speed dating. "Hi my name is Derrick and I like lattes and walks through park. Let's see if there is a match...in 30 seconds or less..."
I have a post coming out this week over at UpMarket / Squidoo, the operation founded by Seth Godin. In the post I go into detail about the way in which many of us use round about, indirect methods to lure people into buying from us, following us, liking us, pinning us, pinching us (did I leave any out?). I long for a simpler time back when we were in the first grade and went up to little Suzie and said, "I like you. Do you want to be my girl friend?" You and little Suzie either skipped over to the swing set, hand in hand, or she socked you in the nose and told you to scram (I got socked in the nose by the way). Painful experiences like those are what first convinced us that we cannot just come right out and say what we want. We have to hint about it or lure people in. Just take a look at a Twitter feed or the ads on Facebook. They are all designed with one goal in mind. Getting someone to buy something, whether a product or an idea. Oh but don't ask people directly to buy. They don't like that. Instead, use a clever picture and compelling copy to get them to click on your link. You see people want to be tricked into clicking. Huh? Okay no one actually says this but doesn't it mean the same thing? Those little pictures on the side on Facebook are ads and we all know it. They want you to buy, read or promote something. If you click, you know you are going to get pitched something. Maybe you are interested. Maybe you are not. Today we need a new type of social networking. A version closer to, "Hey Suzie I really like you." You can either join me on the swings or sock me in the nose. I would prefer this more direct approach over the schemes and games of social networking. So, let's head over to the playground. Hey Suzie, I want you to buy my book because it has a bunch of embarrasing stories about my adventures as an entrepreneur. I help you prevent making the mistakes I made, thereby increasing your chances of success. 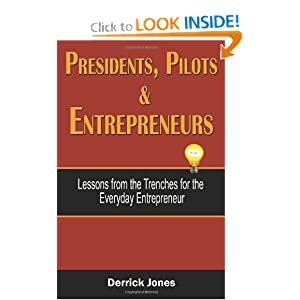 You will also find a complete description of the 3 stages of entrepreneurship, something few authors have discussed. Not only that, I explain how to get through these stages and make your way to the coveted Players Lounge (sorry you have to buy the book to learn what that is). Each chapter includes a section called "In Hindsight" where I detail a personal experience centered around the subject matter of the chapter. I conclude each chapter with "Key Take Aways." This is a numbered list of the main points to serve as a quick reference for future use. 1. The dangers of bank debt and why entrepreneurs should avoid it. 2. How and when to follow your gut in decision making. 3. What it means to fail and how to profit from it. 4. How to integrate your passions into your business to create a compelling customer experience. 5. How to execute the single most important function of the entrepreneur. Okay Suzie, I see your fist is cocked way back and you are ready to pounce, but what about this? In the epilogue of the book I tell two moving stories of what it means to pursue a goal with relentless focus and how to achieve almost anything. I mention both stories on this blog by the way (hint: do a search for "montezuma" to read one of them). In short, this book is both instructional and inspirational. A must read for entrepreneurs at any level, but especially beginning entrepreneurs. The book is available in paperback and kindle on Amazon. It is also available in all eBook formats over at Smashwords. You will also find it in the iBooks store, the Nook and the Sony Kobo. I am sure you will love this book just as others have. Plus, one day you will get to say, "I read that guy's stuff before he was a best selling author." Yep, that is my goal--to be a best selling author. How do I intend to accomplish such a huge feat? When you read the epilogue of my book, you will learn exactly how I intend to. You will also be convinced that you can accomplish just about anything yourself. So, shall we skip to the swings or do you still want to punch me in the nose?